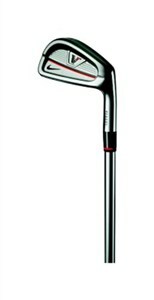 The name of the Nike Victory Red Forged VR Split Cavity irons is a mouthful to say, if nothing else. In all seriousness, though, these are serious golf clubs for serious players. Made from 1025 Forged Carbon Steel (read: soft), these irons are precision forged and then machined to precise tolerances to maximize the performance and feel. The faces are then CNC milled for flatness to further ensure consistent ball flight and uniform ball compression. What Nike calls a "split cavity" looks to me like what many would call a "power bar" or "muscle back" design -- both common to forged irons. This feature concentrates a little more weight in the sole of the club and lowers the Center-of-Gravity (CG) for a higher ball flight. Finally, on the design side, these irons feature a versatile heel grind that is tour-inspired, allowing for increased shot making capability from a variety of lies. By easing the heel profile a bit (the grinding process) the clubhead can be more easily manipulated through and around a less-than-perfect lie -- and still get good contact at impact. Fitted with the tried-and-true True Temper Dynamic Gold shafts, they are available in Regular or Stiff flex. The eight-piece set includes the 3-iron through Pitching Wedge. Grips are the Red Grip from Easton. Easton -- for those who don't know -- is the maker of GolfPride grips. This version has a dual-density design that provides for maximum grip in the top half, and enhanced feel on the bottom of the grip. Visually, these irons are like most forged sets, they are simple in their elegance. A dark chrome finish is offset by the Nike swoosh and the now familiar red/black "V" for Victory that adorn so many hats and shirts on the PGA and other Tours. If a set of forged irons is a consideration, you might also investigate the Titleist AP-2 or ZM-Forged models.